Ok. This week completely got away from me. If you didn’t know, I’m headed out of town tomorrow (wow…tomorrow is Friday, isn’t it?) for the inaugural Nike Women’s Half Marathon in Washington, DC. It’s something I didn’t actually plan on happening, but here I am. Nike has an existing half and full marathon in San Francisco every fall, and this year expanded that series to include a half in DC. Exciting! Of course that meant there was a huge crowd wanting to do this first-time event. Thousands upon thousands. And that included a few of my local friends. We entered the race via the lottery last year as a group. This meant we’d either all get in or none of us would. I didn’t hold my breath. I didn’t even put it on my calendar. Then we got the news. We were in! Yeah! Crap…better get it on the calendar and cross off some other things, including a race at Mohican I was meaning to do. And ALL my spring races, It had nothing to do with the distance. The cost on this one was going to kill me. I get it. The race benefits the Leukemia & Lymphoma Society. They have to get some money out of my registration fees too. Oh…and did I mention the medal? Likely the only way I’m ever getting one of these blue boxes! I can’t wait to see what’s inside! The distance fit into my 50k/50mi training schedule perfectly. I planned on dropping back on distance in preparation for peak week next week. And I really detest the taper anyway, so I’ve been running through this one. I haven’t been to DC in a long time, and I’m excited to run in a new city. The course looks nice with lots of sights to see during the event. I also plan on spending some time running in the area Friday and Saturday. I can’t wait to meet some of my fellow ENERGYbits ambassadors who are running the race as well…two meetups planned with them over the weekend! I hope to post some pictures from the race-related events and from my runs both here and on twitter. Stay tuned…the excitement begins tomorrow! 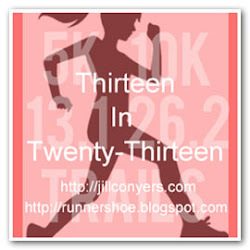 This entry was posted in Life, Training Tools and tagged Busy, life, Running, stress. Bookmark the permalink. Should be a great time!! I definitely didn’t think we’d get in either!